Mahabharata story: I am not crane!!! Once Sage Markandeya visited Yudhistira Maharaja and told the following story – “I am no crane”. Brahmana Kaushika was a strict brahmachari who was strong and steadfast in his austerities. He was well-versed in the study of vedic scriptures. Once he was sitting under a tree reciting vedas. A crane sitting on the tree perched and defiled his head with droppings. Kaushika became very angry and looked at the crane. Just by his angry look the bird was killed and fell down dead. Thereafter another time Kaushika went to beg alms. He stood in front of a house. The housewife was busy in cleaning the utensils. Then her husband arrived. She served him sincerely, washing and drying his feet and then feeding him. After that she came out with alms to the mendicant Kaushika and said, “Sorry, pardon me for waiting”. Kaushika sarcastically chastised her for keeping the brahmana in waiting. The Brahmana was apologetic and he thanked the lady and went to Mithila to meet Dharmavyadha. He thought he is searching for some lonely hermitage. Instead he finally reached a butcher’s shop, in which was a man selling meat. He was astonished when he learnt that this man was Dharmavyadha. The Brahmana was shocked beyond measure and stood at a distance in disgust. The butcher suddenly rose from his seat, came to the Brahmana and inquired, “Revered sir! Are you well ? Did that chaste Brahmana lady send you to me ?” Kaushika Brahmana was stupefied. The Butcher said, “Let us go to my home”. The Brahmana saw there a happy family and greatly struck by the devotion with which he served his parents. He took his lessons from that butcher on dharma, man’s calling and duty. Afterwards Kaushika returned to his house and began to tend his parent’s duty which he had rather neglected before. The moral of this striking story of Dharmavyadha so skillfully woven by Vyasadev into the Mahabharat is the same as the teachings of Gita, that man reaches perfection by the honest pursuit of whatever calling falls to his lot in life, and that this is really worship of God who created and pervades all. The occupation may be one he is born to in society or it may have been forced on him by circumstances or he may have taken it by choice but what really matters is the spirit of sincerity and faithfulness with which he does his life’s work. 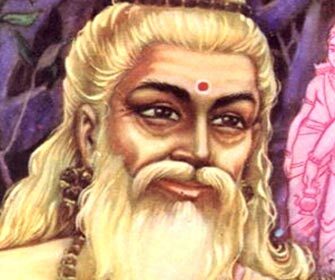 Vyasa Bhagavan emphasizes this great truth by making a scholarly brahmana who did not know it, to learn it from a butcher, who lived it in his humble and despised life.